A very warm welcome to Nutrivisia, leading personalised Nutrition and Wellbeing Clinic in Harley Street, a centre of private medical excellence in the heart of London. Founded by Registered Nutritionist and Microbiologist, Nada Farina, BSc MSc ARCS ANutr, Nutrivisia is unique and industry leading in that it carefully combines your diet, lifestyle and genetic make up with the cutting-edge laboratory testing and analysis to provide personalised, practical, evidence-based, Nutritional and Lifestyle protocols. These health transformation protocols are specifically designed to help you to achieve a better state of health, slow down or, in some cases, prevent development of specific chronic diseases. After often receiving a very limited advice on nutrition from either your GP or a Consultant or misleading nutritional updates from the Media, we understand that it can be a challenge to know what exact steps to take to improve your quality of life with nutrition and lifestyle changes. We are on a mission to fill that gap and make evidence-based nutrition accessible to all. We work closely with the Medical Health Experts in both, Private and NHS sector, to ensure that your health journey is as successful as it possibly can be. Our well-established relationships with the medical consultants enable us to get deeper insights into your present state of health needed to design a detailed health transformation protocols personalised to you and your precise condition. We pride ourselves on a friendly, engaging consultative approach where clients feel welcomed and comfortable in discussing their health concerns. “Nada’s approach to healthy eating and nutrition is grounded in realistic ambitions, taking into account individual needs and lifestyles. Dedicated and professional, Nada is charming, with an easy, warm manner. The personal attention I’ve received has been second to none”. We are a fully accredited member of the Association for Nutrition (AFN), The Nutrition Society, and SENSE Nutritionists, and abide by their strict codes of ethics and practice. We look forward to welcoming you to Nutrivisia, your entire Nutrition and Wellbeing journey, all in one place. I founded Nutrivisia in 2015 with an aim to provide a personalised, evidence-based and realistic nutritional and lifestyle protocols to individuals and corporates looking to improve their overall health and wellbeing. I understand that it can be a challenge to know what steps to take in nutrition in every day life or even after receiving a quick and often very limited nutritional advice from either your GP, or a Consultant or after reading all the conflicting nutritional updates from the Media. Nutrivisia fills this gap in that it provides evidence-based nutritional advice uniquely tailored to your specific needs and lifestyle. We are all different and have different deck of genetic cards and therefore ‘one fits all approach’ does not work. 70% of modern-day illnesses are caused by lifestyle factors and can be reversed or halted by changing our diet and lifestyle. Diabetes, high blood pressure and obesity are at an all-time high and to change this, we need the right knowledge and time to carefully craft the personalised nutritional and lifestyle plans according to individual’s specific needs and lifestyle ensuring that they are realistic as well as achievable. At Nutrivisia we do exactly that – we deliver realistic health solutions based on your present state of health, your genetics, diet and lifestyle. There really is no greater wealth than a good health and nutrition is a powerful tool to achieve this. But firstly, we need to know how our body works and what it needs or it doesn’t need and then we can use food as our ticket to a long-term health and wellness. You may be fit and healthy already and you may think that there is nothing more that you need to know about your nutritional and lifestyle needs but a reality is that you cannot possibly know how healthy you really are unless you assess your health as many conditions are asymptomatic at an early stage. At Nutrivisia we offer Well Woman and Well Man Health Assessments giving you a clear picture of your general health and wellbeing. 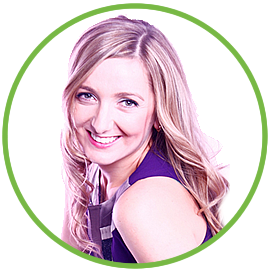 You really are in charge of your own health destiny and we are here to give you profound tools and show you how to make the right changes. My journey into nutrition began 8 years ago when my children were diagnosed with food intolerances to gluten, diary, soya and nuts. Since then I have spent considerable amount of time learning about nutrition and applying it in practice. With my help, both of my children outgrew their intolerances by age 5. I gained Master’s degree in Human Nutrition and have also written ‘Gluten, Dairy, Soya and Nut Free Cooking’ book that has been internationally published by the New Holland Publishers in 2015. The book includes information about allergies and intolerances, balanced healthy eating, replacing nutrients lost through eliminating milk and dairy, raising allergic children and information on food labelling. 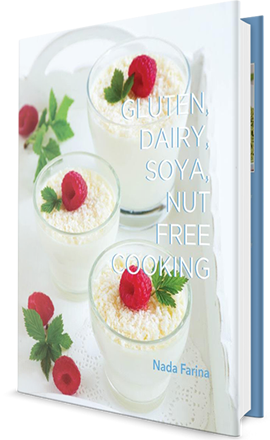 In this book I combine my scientific knowledge and culinary enthusiasm to demonstrate how food free from dairy, gluten, soya and nuts can be wonderfully tasty, easily prepared as well as nutritionally balanced. Prior to qualifying as a Nutritionist, I gained BSc Honours Degree in Microbiology from Imperial College in London and after my research programme in genetics, I also gained MSc in International Management and have then been working in the Investment Banking industry in the city of London for over 10 years. I have also been awarded the Associateship of the Royal College of Science. As a former investment banker, I understand how long hours and challenging deadlines, mixed with client lunches and travel, often make eating healthily, as well as sleeping adequately, a real challenge. It eventually takes its toll as you become too busy to prioritize your health. Being stressed out, short on time, tired and struggling to fit health and fitness into your busy schedule are just a few things very familiar to most of us these days. Now is better time than ever to prioritize your health, your greatest wealth. No matter what your health goal is, you need a well-defined plan to reach it as ‘without a plan, you plan to fail’ You are unique, so is the health and nutrition protocol that you need. I’m committed to creating a world where the right nutritional knowledge and resources are accessible to all. For larger projects and when necessary, we work in a partnership with a team of amazing Nutritionists and/or Dietitians that we pull in at the right time for the right project to ensure we can provide flexible service to all our clients. Gluten, Dairy, Soya and Nut Free Cooking cookbook brims with imaginative and wonderfully tasty recipes, all designed with our busy lifestyles in mind: most are quick and easy to prepare, with many suitable for freezing. All the recipes are free from gluten, dairy, soya, nuts, lupin, mustard, peanuts, sesame seeds and tree nuts. This book is a real eye-opener as it shows how with easy to find ingredients and with a touch of imagination and creativity, one can easily prepare incredibly tasty, healthy and nutrition-packed meals even when on a very restricted diet. The book is aimed at all of you, whether you are a lifestyler, have food allergy or food intolerance or other medical conditions that favour gluten and/or dairy-free eating or whether you are a meat-eater, seafood-lover, vegetarian or vegan. Truly excellent book! Well set out, easily readable and every recipe has a photo which makes it easier to decide what to cook. It includes the nutritional information section for every ingredient which is an extra bonus I think. There is also additional useful information about things such as the Eatwell plate diet. I am intolerant to dairy, soya and gluten and was really struggling to find a book that would include ‘normal’ everyday recipes while excluding all these ingredients. I already tried two of my favourite dishes, beef lasagne and crème caramel, that I actually thought I will never be able to eat again. All of those dishes tasted even better than I remember. There are many other recipes that I am looking forward to try. This book is fantastic. It is beautifully presented, easy to follow and, above all, very practical, all of which made my transition to a dairy/gluten/soya free diet much easier. There is a fantastic selection of interesting recipes; I made the potatoes and Jerusalem artichoke dauphinoise last night and it was really delicious, even though it was made without cream! I highly recommend this book for anyone on a restricted diet – it will vastly broaden your meal repertoire. This timely cookbook is a brilliant amalgam of every kind of intolerance you are likely to encounter. And Nada Farina’s first hand experience of the subject really shines through, the recipes have real conviction and are clearly original and the work of a cook who has been faced by the serious challenge of her children not being able to eat so many foodstuffs. Her cakes are fab! You really cannot tell that any of the usual ingredients are absent. 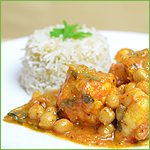 This delightful monkfish and chickpeas combo will satisfy even the fussiest of eaters. The mild and sweet flavour of the monkfish perfectly complements the slightly grainy texture and nutty flavour of the chickpeas. This delicious dish is also packed with masses of nutrients that your body and mind will love. In fact, monkfish naturally contains vitamins B6 and B12 that aid in the synthesis of neurotransmitters needed for brain function. This flavoursome and low-fat dish is also rich in easily digestible proteins and dietary fibre. Serve it warm with rice or quinoa or even with a crunchy salad, and enjoy. 1. Cut the monkfish fillet into large 4 cm (1. inch) chunks, dry well with kitchen paper and put aside. 2. Place the corn flour into a small bowl and add a pinch of salt. Place each monkfish piece onto the corn flour and gently coat with the flour on all sides, removing any excess flour. 3. Heat the olive oil in a large non-stick frying pan on a medium heat and gently fry the monkfish slices for 5 minutes or until browned on all sides. 4. Add the shallots and gently fry for 3 minutes or until soft. Stir in the tomato paste, vegetable stock, paprika, cardamom seeds, basil, brown sugar, anchovy paste and chickpeas, season with salt and pepper and simmer gently for 15 minutes. 5. Serve warm with steamed rice. 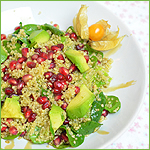 This delightful and easy to make salad offers all the nutritious benefits of protein- and fibre-rich quinoa, iron-rich spinach, B vitamins and monosaturated fats-rich avocado and antioxidants rich pomegranate. It’s a perfect colourful summer dish on its own or as a side with fish or chicken. 1. Rinse the quinoa in cold water in a fine-mesh strainer. 2. Bring the vegetable stock to a boil and stir in the quinoa. 3. Uncover and simmer for about 10 minutes or until a small spiral becomes visible in each grain. Drain the quinoa and transfer it to a medium bowl. 4. Add the spinach and toss with the hot quinoa until slightly wilted. Add the sliced avocado and toss again. 5. Generously sprinkle the salad with the fresh pomegranate seeds and glaze with 2 tablespoons of the pomegranate molasses. Enter your e-mail to receive the latest news and expert advice from Nutrivisia. to enquire or book your consultation. We look forward to welcoming you to Nutrivisia.